1979 had seen the end of the turbulent Graham Williams era of the show. It had been highly criticized for a lack of substance and too much comedy, but Williams had had a number of behind-the-scenes problems to deal with. In late 1979, John Nathan-Turner took over the role of producer having worked for two years as a production unit manager. 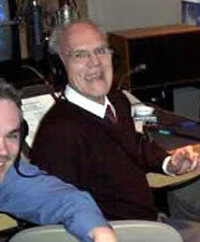 ‘JNT’, as he became known, wanted to stamp his authority on the show and get it back on an even keel. Initially he was reluctant to use writers and directors that had worked on the show previously hoping that fresh blood would inject new life into the proceedings. The 18th season of Doctor Who, and Tom Baker’s last, certainly felt new. 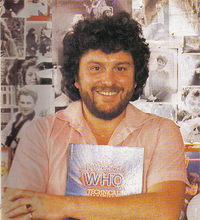 Not only had the opening titles been changed for the first time in seven years, but also a new contemporary theme music was introduced and there was a new costume for the Fourth Doctor. The look of the show was vastly changed with JNT making sure that large parts of the budget was spent on the onscreen areas. They were changes that not everyone had liked. One of JNT’s early jobs was to cast a new actor in the role of The Doctor, and he was aware that anyone following Tom Baker would need to be vastly different. A youthful Peter Davison was eventually cast, who was well known for roles in All Creatures Great and Small and Sink or Swim. The public in general liked what they saw of this new Doctor, and viewing figures increased. Aware that the 20th anniversary of the show was approaching, JNT made early plans for a celebratory episode not unlike The Three Doctors. His vision was for all surviving actors who had played The Doctor to be reunited. 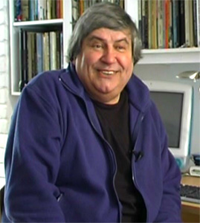 JNT and script editor Eric Saward first began planning in August 1981 and contact was made with David Reid (head of serials) who was happy for such a story to take place. However due to Peter Davison’s role in the popular comedy Sink or Swim the production of the entire series of Doctor Who had to shift, meaning no season was set to be broadcast in the actual anniversary. As a result, the commemorative adventure would become a one-off isolated episode. In the November of 1981 Peter Davison’s first full season was fast approaching. The public were to get an early viewing of the new Doctor in costume at The Lord Mayor’s Parade in London on the 14th of that month. This annual event had been running since 1535 and Doctor Who, and the Daleks in particular, had been the stars before in 1972. Three Daleks (including a gold coloured fan built prop) starred with Davison on the BBC float, including, reunited for the first time on television since the 1960s, the shoulders and skirt of Dalek Seven. 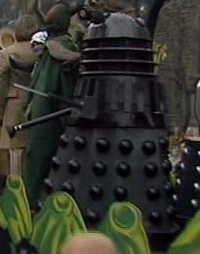 Also appearing on the float was Dalek One-ii. Both BBC props had been seen a small amount of refurbishment having been repainted and generally tidied up. Meanwhile work continued on the Anniversary special and although JNT was reluctant to use previous writers, Saward convinced JNT to look over the work of Robert Holmes who had been one of the most well-received writers on the show. JNT was persuaded to ask Holmes if he would like the job of scripting the anniversary episode, although Holmes was reluctant as he didn’t like to use other writers’ creations. Eventually he agreed and set about producing some possible storylines in August 1982. These didn’t include the Daleks. Holmes was never comfortable with writing for unfamiliar characters, and he expressed concerns that he was struggling with the remit. Saward duly contacted another long term contributor to Doctor Who, Terrance Dicks, to ask if he would be on standby. October saw Holmes formally give up on the project and Dicks quickly stepped in with ideas of his own. Dicks insisted the Daleks had to be part of an anniversary celebration, and his storyline was commissioned soon after on 16th November. 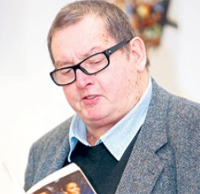 In the meantime JNT was searching out a director to deal with the complexity of the work involved and ultimately Peter Moffat was selected due to his work on the previous stories State of Decay, The Visitation and Mawdryn Undead. The script development still had problems due to the constant flux of actors availability. Cameo parts which had been written in had to be removed and others invented as other actors became available. Once it had been decided to include the Daleks in the episode, it was suggested quickly that they remain in studio due to the problems of filming on location. The Cybermen and Master would be employed as the main enemies and as such it turned out just one Dalek would be needed for the short cameo. Two Daleks did manage to get onscreen briefly on 24th March 1982 in ITV television’s This Is Your Life when Peter Davison was surprised by Eamonn Andrews. This Is Your Life was one of ITV biggest shows and regularly featured high profile guests. JNT arranged the surprise by setting up a fake promotional event, informing Davison it was for Australian TV. 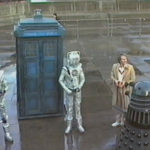 The Tardis prop was set up in Trafalgar Square in London with Matthew Waterhouse, Janet Fielding, Sarah Sutton and Anthony Ainley also in on the set-up. 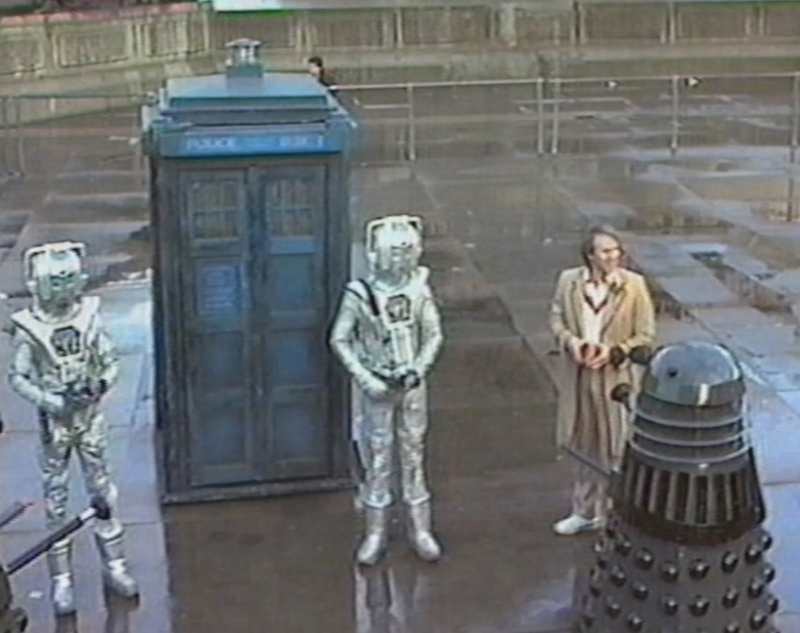 Cybermen and two Daleks, including the complete Dalek Seven, completed the line-up. The recording was made on 17th March. The press was well aware of the upcoming anniversary plans for Doctor Who. Not only would there be the anniversary special, there was also an official BBC convention planned for the April Bank Holiday weekend. Promotion for both started early. With all the anniversary actors not yet starting location filming, they were free to appear on news programme’s. One of the first of these appearances was on the BBC’s early morning show Breakfast Time. 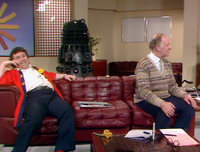 Peter Davison and Patrick Troughton were interviewed on 1st March 1983, with both actors in playful mood. Watching over proceedings was a Dalek who had gate crashed the reading of the daily horoscopes. Since their last appearance at The Lord Mayors Show, the shoulders of Dalek One had been reunited with the skirt of Dalek Seven and it was this Dalek One-7 combination lurked behind Russell Grant. The prop had been given some refurbishment, mainly consisting of a coat of grey paint (although strangely the lower area of the shoulders remained silver), and the eyestalk had also been neatened up. Location filming for the special – which was know entitled The Five Doctors – got underway on the 5th March and continued until the 18th. The main stars were not needed on the 17th so Peter Davison, Patrick Troughton and Jon Pertwee made an appearance on Nationwide, a long time ‘friend of the show’. Again the actors were in jovial mood and Dalek One-7 was in attendance. Around this time the popular Radio Times magazine was preparing a special that would be released in the November to coincide with the 20th anniversary. The magazine would cover a number of subjects including the five actors to play the Doctor, the companions, conventions, monsters and merchandise. There were also interviews with some of the behind-the-scenes staff and pictures taken of them doing their daily routines. Included in this casual snaps feature was a rare behind the scenes picture inside the BBC’s visual effects department showing with Peter Wragg next to a Dalek prop. 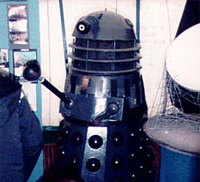 The picture was taken in the lead up to the studio taping of The Five Doctors and shows the original dome intended for use in the special (complete with new red lights), but the shoulders belonged to Dalek Seven whilst the skirt was that of Goon ii. Despite the refurbishment taking place in the photo, and the date it was taken, it had little to do with the prop for the forthcoming TV appearance. 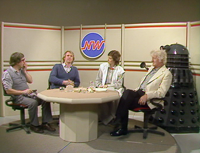 Studio taping sessions for the anniversary extravaganza got underway on the 29th March 1983 and the scenes involving the Dalek filmed the following day. The in-demand Dalek One-7 was the prop selected for the part and some of the blue paint on the Goon neck cage was still visible from its bizarre Pebble Mill appearance three years earlier. As seen in the Radio Times photo, the lights were now large and red, and a big chunk was missing from the rear of the dome. A smaller chip had been taken out of the front of the head, and the eyestalk had been moved back. The pivot slot had been filled slightly so the eye could no longer look down to such a large degree. The refurbishment prior to Pebble Mill did little to enhance the prop and overall it had a disheveled appearance. It was clear that the shoulders were only half painted and silver could still be seen all the way around the lower section. All in all the prop was a visual mess of parts, not helped by the new wood affixed on the underside of the shoulders that made them sit up high on the skirt. The dome rotation system had already made the dome sit too high, and as such the prop looked damaged, badly-painted and incorrectly-assembled. The poor-showing was all the more disappointing considering the occasion. 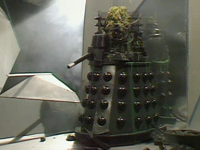 The short scenes using the Dalek culminated in the destruction of the Dalek, and a lightweight upper section was constructed to achieve the effect. The shoulder section had many more slats than the Dalek it was attempting to copy and, ironically, looked somewhat tidier overall. This FX dummy was placed on the skirt of Goon ii, and at the correct time the prop was blown apart to reveal a Dalek mutant flailing around. The bank holiday weekend of 3rd and 4th April would see thousands of fans descend on Longleat House in the south west of England. A Doctor Who exhibition had been a feature at the house since 1973 when a visual effects area was on display, and a permanent exhibition was opened the following year. It was decided that the grounds and facilities of the House could cope with a large convention as Longleat was used to coping with large amounts of visitors to its Safari Park. All sort of special areas were planned for the day – SFX tents, costume displays, signings, a cinema showing old episodes that were rarely seen in those days, and a large auction of props. The BBC vastly underestimated the numbers that would turn up with many having to be turned away. Massive queues formed for every area and event and for many it was a mixed experience. The Daleks were of course part of the event and two full props were on display. Fresh from taping The Five Doctors, Dalek One-7 appeared in the SFX tent. 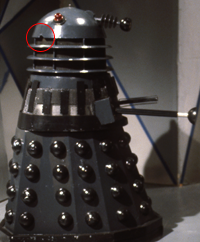 The red lights inserted for recording had already been removed and the tent also featured the FX Dalek. The other main prop to appear was the ‘Tussauds’ Dalek featuring the top of Dalek Six and its skirt built for exhibition prior to Destiny of the Daleks, hence termed Dalek Six-ex. It was still in fine condition having been on display for the best part of two years and was placed with the main sets display. Perhaps the oddest appearance came in the photographic area. The TARDIS prop was erected in the tennis court area, surrounded by several monsters where the public could have a picture taken with the props to remember their day. Alongside the TARDIS was a strangely short Davros. 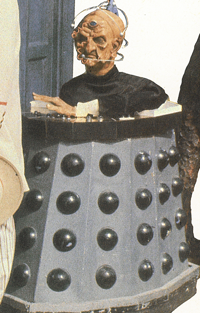 The skirt of Dalek Five had been temporarily converted into Davros’ chair and a dummy of the Kaled scientist’s torso was placed inside. Unfortunately the body was sunk inside the skirt so low the whole effect was ruined as the prop looked very comical. Ed Stewart sat in Dalek Six-ex. The blue Dalek Six-ex was to star twice more before the year was out, and both times it was the Radio Times that would be the reason. Ed ‘Stewpot’ Stewart had been a famous personality throughout the 1970s and 1980s with his work on Radio 1 and 2, and also the very popular children’s show Crackerjack. 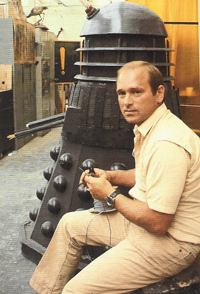 The Radio Times featured Stewart in a set of photos with props form the Madame Tussauds exhibition, including a shot where he sits inside Dalek Six-ex. 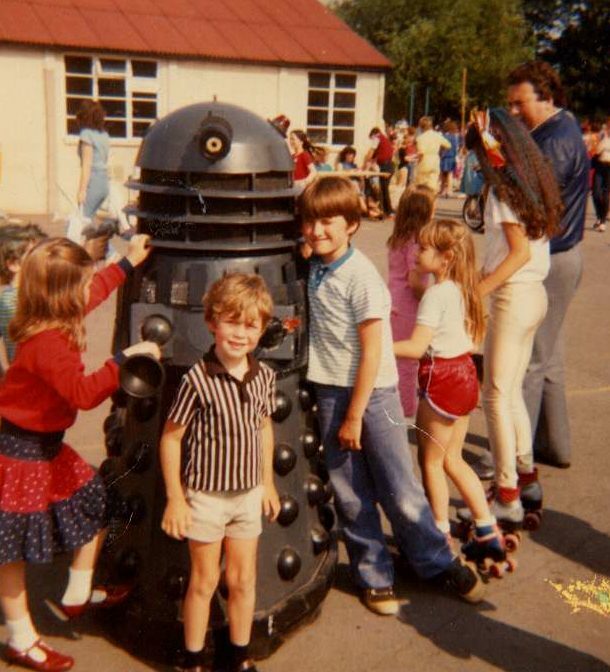 Dalek One-7 visits Latchmere School in the summer of 1983. Picture – Phillip Ayres. Click for a larger view. Dalek Six-ex was also a major star in the Radio Times 20th anniversary special that was released in November. In the days of relatively rare Doctor Who magazine coverage publications like this fired the fans’ imagination. The whole rear cover was given over to an image of the strange prop still in its Tussauds blue, although by this time the eyediscs and eyestalk had been changed to white. The image became one of the most famous and helped to give the prop its memorable status. Although 1983 had seen no specific Dalek story, it was fitting that in the anniversary year, various original Shawcraft prop components were still going strong, in combination with sections built in the seventies. 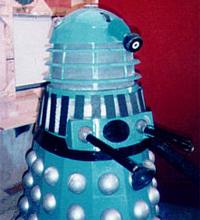 It was especially appropriate that in the commemorative episode, a prop was used that had been assembled from the oldest surviving top half, and a skirt that had been in use since 1965 – Dalek One-7.